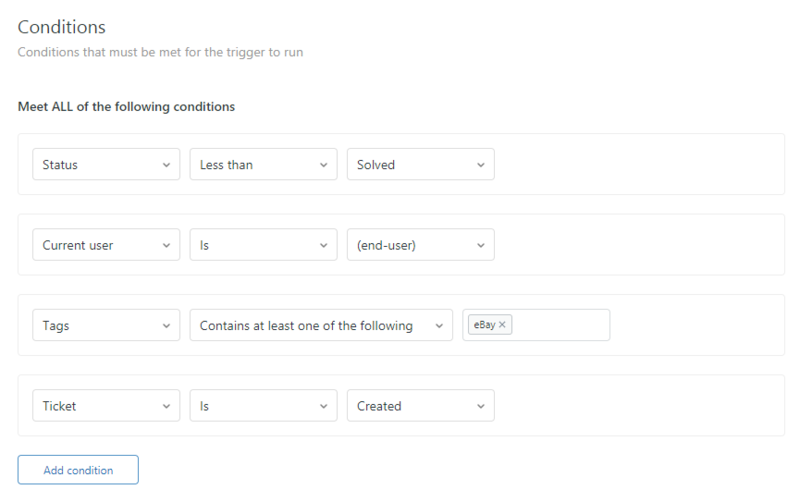 You might have already tried using triggers to automatically send messages to eBay or Amazon and had nothing happen. Don't worry—using ChannelReply and Zendesk as an eBay and Amazon autoresponder just takes a little extra setup. Plus, it will even count toward Amazon’s 24-hour response SLA! Don't have a ChannelReply account yet? Try it free! Or if you use Freshdesk, see our Freshdesk autoresponder instructions. Note: Click on any image to view it at full resolution. Last updated 4/3/2019. This autoresponder system generates messages once every half-hour. It could be up to 35 minutes before an auto-reply appears on a Zendesk ticket, so keep calm and carry on if nothing happens right away. You can safely answer your messages at any time. 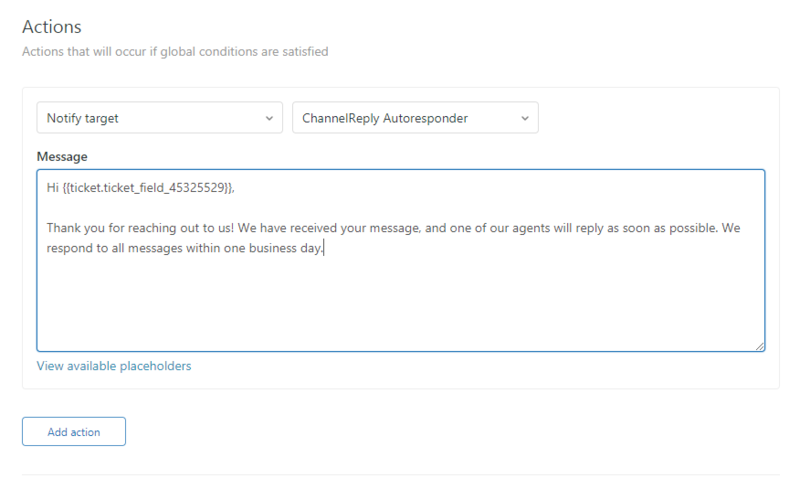 If an agent sends a response before the auto-reply appears in Zendesk, ChannelReply cancels the auto-reply and delivers your message immediately. The customer will only see the human response. 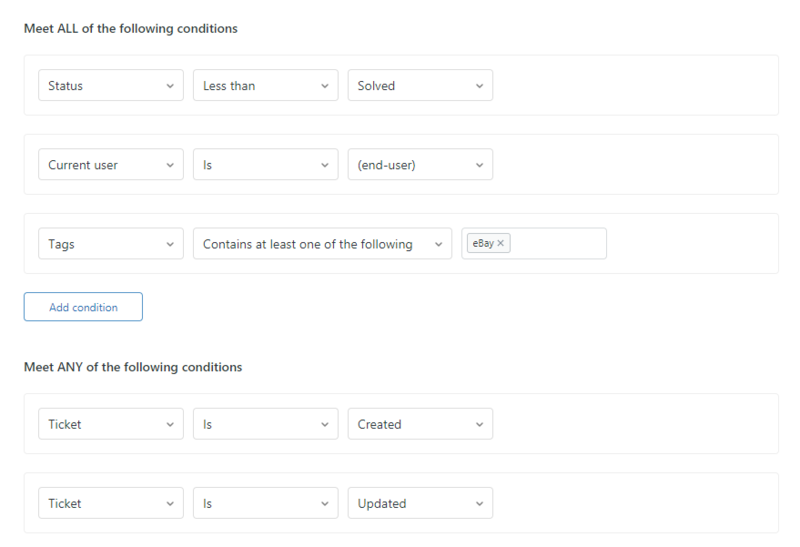 If you haven’t changed or deactivated Zendesk’s default triggers, be warned that some might go off at the same time as an Amazon or eBay autoresponder. This could result in a barrage of error notifications, or worse, your customers seeing multiple auto-replies. 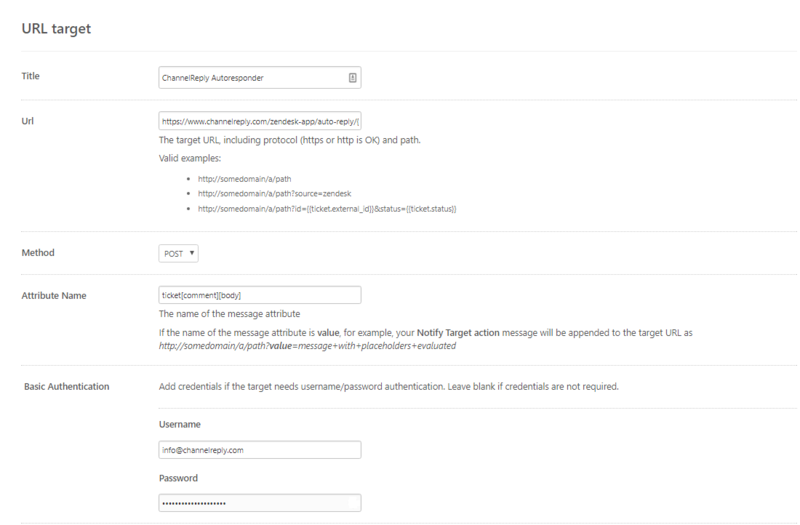 Follow the steps below to prevent double messaging from Zendesk’s default triggers. 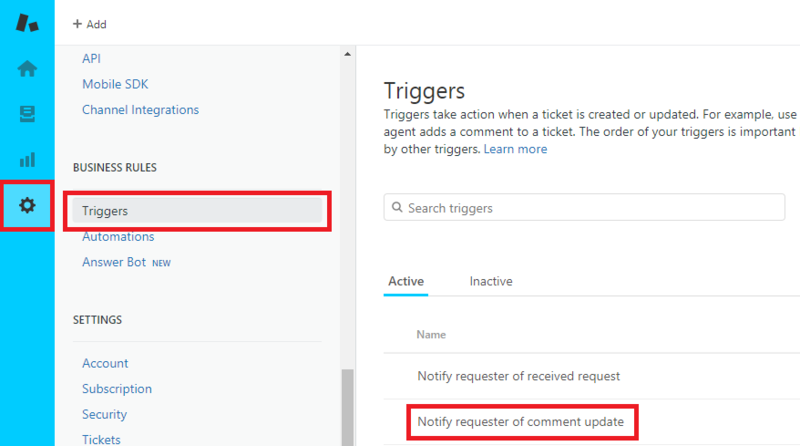 If you’ve built custom triggers/automations that work as autoresponders, take the same steps with those to prevent them from firing as well. This stops Zendesk’s default auto-reply from trying to answer marketplace messages. It will still work for normal emails. This will make sure your customers never get two copies of your automatic responses. Go to Admin -> Extensions (under “Settings”) -> Targets -> add target. Choose “URL target” from the list. In the “Basic Authentication” fields, enter your ChannelReply username and password. You can then test and create your new target with the options at the bottom right. Now you can design your autoresponder! It’s up to you which of your marketplace accounts your autoresponder will answer. It all depends on which ChannelReply tags you enter when following the steps below. For example, if you wanted an autoresponder that answered messages from all your Amazon and eBay accounts, you would use all your ChannelReply tags. If you wanted a unique autoresponder for just one Amazon account, you would only enter the tag for that one account. You can make as many autoresponders as you want. See the “Tips” section later in this article for advice on creating more after the first is complete. In the “Message” field, enter the automatic response you would like your customers to receive. Be careful not to include any links, as most links are forbidden by both Amazon and eBay. Now you can choose how you want the autoresponder to run. Follow the instructions below under Option A if you only want it to reply once per ticket, or under Option B if you want it to reply to every message. You’re all set! Responses will be delivered once per ticket if you chose Option A, or every time the buyer messages you if you chose Option B. That way, the trigger will only fire when nobody is available to answer tickets. 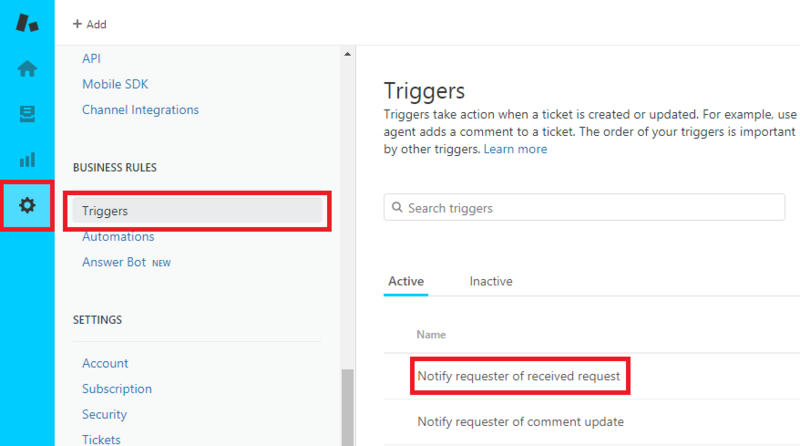 Return to Admin -> Triggers in Zendesk. Click the column of dots on the right, then click Clone. Remove the tags you used for the last trigger. Replace the old tags with the tags for the account(s) you want this new autoresponder to work for. Make any other desired changes, such as updating the message. Click “Create” to save your new autoresponder. Congratulations on setting up your eBay/Amazon autoresponders! For more time-saving options, see our other advanced setup tutorials. Or, if you have any questions or get stuck, just contact us and we’ll be happy to help!